I’m going to try and keep this short and sweet. Proust, among the many things he has to teach us, teaches how to see, not through his eyes but through our own eyes, and in ways we never imagined possible. And I have to thank all of you who, through your posts, your questions, your comments, and your emails, helped to show me ways to read In Search of Lost Time that I never imagined possible. It has been an extraordinary journey — a little more than a year completely immersed in Proust. Knowing that you were out there forced me to read the book more closely than I’ve ever read anything in my life. Forced me to think about it more constantly than I have any other book. Forced me to look at, analyze and write about the book in ways that not only kept me interested but kept the hundreds of readers around the world who have been following the blog interested as well. For that, for your constant inspiration, for the friendships I’ve made, I am eternally grateful. I wish you all the very happiest of new years, and I hope to see you next week when Project D is officially launched. Why can’t I quit this blog? Travelling by car southwest of the cathedral town of Chartres, the view through the windscreen is of a familiar northern European arable landscape. One could be anywhere, the only feature of note being a flatness to the earth which lends disproportionate significance to the occasional water tower or agricultural silo asserting itself on the horizon above the windscreen wipers. The monotony is a welcome break from the effort of looking at interesting things, a time to rearrange the twisted accordion-shaped Michelin map before reaching the chateaux of the Loire, or to digest the sight of Chartres cathedral with its claw-like flying buttresses and weather-worn bell-towers. The smaller roads cut through villages whose houses are shuttered for a siesta that appears to last all day; even the petrol stations show no signs of life, their Elf flags flapping in a wind blowing in from across vast wheatfields. A Citroen makes an occasional hasty appearance in the rear-view mirror, then overtakes with exaggerated impatience, as if speed was the only way to protest against the desperate monotony. At the larger junctions, sitting innocuously among signs vainly asserting a speed limit of ninety and pointing the way to Tours and Le Mans, the motorist may notice a metal arrow indicating the distance to the small town of Illiers-Combray. For centuries, the sign pointed simply to Illiers, but in 1971 the town chose to let even the least cultured motorist know of its connection to its most famous son, or rather visitor. For it was here that Proust spent his summers from the age of six until nine and once again at the age of fifteen, in the house of his father’s sister, Elisabeth Amiot — and here that he drew inspiration for the creation of his fictional Combray. Competition is fierce with the boulangerie in the Place du Marche, for it too is involved in the ‘fabrication de la petite madeleine de Marcel Proust‘. A packet of eight can be had for twenty francs, twelve for thirty. The boulanger — who hasn’t read it — knows that the shop would have had to close long ago had it not been for In Search of Lost Time, which draws customers in from across the world. They can be seen with cameras and madeleine bags, heading for the house of tante Amiot, an undistinguished, rather sombre edifice that would be unlikely to detain one’s attention were it not for the fact that within its walls young Proust once collected impressions used to build the narrator’s bedroom, the kitchen where Francoise prepared her chocolate mousse and the garden gate through which Swann came for dinner. Inside, there is the hushed, semi-religious feel reminiscent of a church, children grow quiet and expectant, the guide gives them a warm if pitying smile while their mothers remind them to touch nothing along the way. There turns out to be little temptation. The rooms recreate in its full aesthetic horror the feel of a tastelessly furnished, provincial bourgeois nineteenth-century home. Inside a great perspex display cabinet next to ‘tante Leonie’s bed’ the curators have place a white teacup, an ancient bottle of Vichy water and a solitary, curiously oily-looking madeleine, which on closer inspection reveals itself to be made of plastic. Though Larcher displays admirable civic feeling and would no doubt be applauded by every patissier involved in the madeleine trade, one wonders after such a day whether he is not at risk of exaggerating the qualities of his town, and unwittingly diminishing those of Proust. More honest visitors will admit to themselves that there is nothing striking about the town. It looks much like any other, which doesn’t mean it is uninteresting, simply that there is no obvious evidence of the privileged status which monsieur Larcher accords it. It is a fitting Proustian point: the interest of a town is necessarily dependent on a certain way of looking at it. Combray may be pleasant, but it is a valuable a place to visit as any in the large plateau of northern France, the beauty which Proust revealed there would be present, latent, in almost any town, of only we made the effort to consider it in a Proustian way. Ironically, however, it is out of an idolatrous reverence for Proust, and a misunderstanding of his aesthetic ideas, that we speed blindly through the surrounding countryside, through neighbouring non-literary towns and villages like Brou, Bonneval and Courville, on our way to the imagined delights of Proust’s childhood locale. In so doing, we forget that had Proust’s family settled in Courville, or his old aunt taken up residence in Bonneval, it would have been to these places that we would have driven, just as unfairly. Our pilgrimage is idolatrous because it privileges the place Proust happened to grow up in rather than his manner of considering it, an oversight which the corpulent Michelin man encourages, because he fails to recognize that the worth of sights is dependent more on the quality of one’s vision than on the objects viewed, that there is nothing inherently three-star a bout a town Proust grew up in or inherently no-star about an Elf Petrol station near Courville, where Proust never had a chance to fill a Renault — but where if he had, he might easily have found something to appreciate, for it has a delightful forecourt with daffodils planted in a neat border and an old-fashioned pump which, from a distance, looks like a stout man leaning against a fence wearing a pair of burgundy dungarees. It should not be Illiers-Combray that we visit: a genuine homage to Proust would be to look at our world through his eyes, not look at his world through our eyes. To forget this may sadden us unduly. When we feel interest to be so dependent on the exact locations where certain great artists found it, a thousand landscapes and areas of experience will be deprived of possible interest, for Monet only looked at a few stretches of the earth, and Proust’s novel, though long, could not comprise more than a fraction of human experience. Rather than learn the general lesson of art’s attentiveness, we might seek instead the mere objects of its gaze, and would then be unable to do justice to parts of the world which artists had not considered. 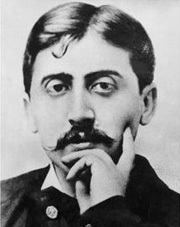 As a Proustian idolater, we would have little time for desserts which Proust never tasted, for dresses he never described, nuances of love he didn’t cover and cities he didn’t visit, suffering instead from an awareness of a gap between our existence and the realm of artistic truth and interest. The moral? There is no great homage we could pay Proust than to end up passing the same verdict on him as he passed on Ruskin, namely, that for all its qualities, his work must eventually also prove silly, maniacal, constraining, false and ridiculous to those who spend too long on it. Even the finest books deserve to be thrown aside. Aside from the danger of overvaluing writers and undervaluing oneself, there is a risk that we will revere artists for the wrong reasons, indulging in what Proust called artistic idolatry. In the religious context, idolatry suggests a fixation on an aspect of religion — on an image of a worshipped deity, on a particular law or holy book — which distracts us from, and even contravenes, the overall spirit of the religion. Proust accused his friend, the aristocrat and poet Robert de Montesquiou, of artistic idolatry, because of the pleasure he took whenever he encountered in life an object which had been depicted by an artist. Montesquiou would gush if he happened to see one of his female friends wearing a dress like that which Balzac had imagined for the character of the Princesse de Cadignan in his novel Les Secrets de la Princesse de Cadignan. Why was this type of delight idolatrous? Because Montesquiou’s enthusiasm had nothing to do with an appreciation of the dress and everything to do with a respect for Balzac’s name. Montesquiou had no reasons of his own for liking the dress, he hadn’t assimilated the principles of Balzac’s aesthetic vision, nor grasped the general lesson latent in Balzac’s appreciation of this particular object. Problems would therefore arise as soon as Montesquiou was faced with a dress which Balzac had never had a chance to describe, and which Montesquiou would perhaps ignore — even though Balzac, and a good Balzacian, would no doubt have been able to evaluate the merits of each dress appropriately had they been in his shoes. Food has a privileged role in Proust’s writings; it is often lovingly described and appreciatively eaten. To name but a few of the many dishes which Proust parades past his readers, we can site a cheese souffle, a string bean salad, a trout with almonds, a grilled red mullet, a bouillabaisse, a skate in black butter, a beef casserole, some lamb with a Bearnaise sauce, a beef Stroganoff, a bowl of stewed peaches, a raspberry mousse, a madeleine, an apricot tart, a raisin cake, a chocolate sauce and a chocolate souffle. The contrast between what we usually eat and the mouthwatering nature of the food Proust’s characters enjoy might inspire us to try and savour these Proustian dishes more directly. In which case, it could be temping to acquire a copy of a glossily illustrated cookbook entitled La Cuisine Retrouvee, which contains recipes for every dish mentioned in Proust’s work, is compiled by a top Parisian chef and was first published in 1991 [by a company otherwise responsible for a comparably useful title, Les Carnets de Cuisine de Monet]. It would enable a moderately competent cook to pay extraordinary homage to the great novelist, and perhaps gain a closer understanding of Proust’s art. It would, for instance, enable a dedicated Proustian to produce exactly the kind of chocolate mousse which Francoise served to the narrator and his family in Combray. Ingredients: 100g of plain cooking chocolate, 100g of caster sugar, half a liter of milk, six eggs. Method: Bring the milk to the boil, add the chocolate broken in pieces, and let it melt gently, stirring the mixture with a wooden spoon. Whip the sugar with the y0lks of the six eggs. Preheat the oven to 130C. When the chocolate has completely melted, pour it over the eggs and the sugar, mix rapidly and energetically, then pass through a strainer. Pour out the liquid into little ramekins 8cm in diameter, and put into the oven, in a bain-marie, for an hour. Leave to cool before serving. But once the recipe had resulted in a delicious dessert, in between mouthfuls of Francoise’s chocolate mousse, we might pause to ask whether this dish, and by extension the entire volume of La Cuisine Retrouvee, really constituted a homage to Proust, or whether it was not in danger of encouraging the very sin which he had warned his readers about, artistic idolatry. Though Proust might have welcomed the principle of a cookbook based on his work, the question is what form he would have wished it to take. To accept his arguments about artistic idolatry would mean recognizing that the particular foods which features in his novel were irrelevant when compared to the spirit in which the food was considered, a transferable spirit which owed nothing to the exact chocolate mousse which Francoise had prepared, or the particular bouillabaisse which Mme Verdurin had served at her table — and might be as relevant when approaching a bowl of muesli, a curry or a paella. The danger is that La Cuisine Retrouvee will unwittingly throw us into depression the day we fail to find the right ingredients for the chocolate mousse or green bean salad, and are forced to eat a hamburger — which Proust never had a chance to write about. Enjoy your weekend everybody. And a very merry Christmas to all. Because books are so good at helping us become aware of certain things we feel, Proust recognized the ease with which we could be tempted to leave the entire task of interpreting our lives to these objects. Because this suitor had tried unsuccessfully for years to make himself loved by a woman who would only have made him unhappy if she had loved him, Proust conjectured that the link between his own life and the aphorism would deeply move this unfortunate character. He would now read the passage over and over again, swelling it with meaning until it was ready to burst, appending to the aphorism a million words and the most stirring memories of his own life, repeating it with immense joy because it seemed so beautiful and so true. Though it was undoubtedly a crystallization of many aspects of this man’s experience, Proust implied that such extreme enthusiasm for La Bruyere’s thought would at some point distract the man from the particularities of his own feelings. The aphorism might have helped him to understand part of his story, but it did not reflect it exactly; in order fully to capture his romantic misfortunes, the sentence would have had to read, ‘Men often want to be loved…” rather than ‘Men often want to love.’ It wasn’t a major differe3nce, but it was a symbol of the way that books, even when they brilliantly articulate some of our experiences, may nevertheless leave others behind. I saw this piece on 60 Minutes last night. There’s been a new discovery in the field of memory, known as “superior autobiographical memory.” It’s very rare, only six people have been identified with it so far, including, oddly enough, actress Marilu Henner. These people, quite literally, never forget anything that took place during their lives. What they wore on March 23, 1987. Who they were talking with that day and what they were wearing. What day of the week it was. What the weather was like. It’s amazing. And frightening. “You really do remember your whole life,” Stahl remarked. “It’s like putting in a DVD and it cues up to a certain place. I’m there again. So, I’m looking out from my eyes and seeing things visually as I would have that day,” she replied. “Do you remember all your old boyfriend’s birthdays? I’ll bet you do,” Stahl asked. “But what exactly does “normal” mean, when you remember every day of your life? When everything good – and everything bad – that has ever happened to you is right there, instantly accessible? “When you look back at painful memories, is it just as raw?” Stahl asked. “Sometimes it’ll be as though it happened yesterday. Sometimes, it’s as though it happened last week,” Owen said. Just the mention of a sad day, like the one in 1986 when Owen learned she’d have to change schools , and she relives it emotionally. “I felt like my whole world was collapsing. And you say that and it’s like all of a sudden I feel like this really heartbroken little 13-year-old all over again,” she explained. She said the feeling was vivid and awful, even after all these years. “I mean, my heart is actually pounding right now in telling you this,” she told Stahl. She says her memory is a gift, but there are definitely downsides. Naturally, I couldn’t help but think would Proust might think about this, given his view that it’s our ability to forget, the very fact that memory fades, that makes life bearable. If you’re interested in reading more, here’s the link. I wasn’t going to post again until Monday, but I’ve been thinking and thinking about this piece since I read it earlier this week, and the more I think about it, the angrier I get. Please read — I’ll have comments at the other end. Oprah’s misguided view of Charles Dickens—and literature as a whole. On December 2, as Oprah Winfrey stood on the stage of her TV show, tightly clutching her newest Book Club selection to her chest so that no one could see its title, she proclaimed in her singular, scale-climbing voice, “Dickeeeens for the hooolidaaaays!” Oprah declared that she has “always wanted to read Dickens over the holidays,” and “now [she] can.” Never mind that she could have read Dickens whenever she wanted, seeing as his books have been popular for more than a century. Never mind that Oprah hadn’t chosen A Christmas Carol, The Chimes, or any of Dickens’s other Christmas tales. Never mind that neither Great Expectations nor A Tale of Two Cities, the books she did choose, have anything to do with the holidays. Our shepherd has spoken, and we must blindly follow. Billed as “A Date with Dickens,” Oprah’s sentimentalized pitch for consuming the author’s work—it’s “cup of hot chocolate” reading—is sure to inspire a frightening number of purchases. Just as they have for the past 14 years, cadres of women around the globe will flock to bookstores to nab covers with a small circular “O” sticker on the top right corner. Oprah has proven that she can catapult a contemporary author from obscurity to fame; but, more interestingly, she’s shown she can also revivify the great novels. Dubbed the “Oprah Effect,” Winfrey’s seal of approval and magnanimous praise has bolstered the sales of dozens of novels and, in turn, annoyed bitter English teachers everywhere. After all, Oprah is doing the impossible—she is convincing the masses to purchase and read classics. In recent years, Oprah’s contemporary choices have wavered wildly, between new classics and “one-dimensional” heart-wrenchers (as Jonathan Franzen so aptly put it back in 2001). The Road (also a Pulitzer-Prize winner) introduced the world to the menacingly minimal prose of Cormac McCarthy, but Fall on Your Knees (Anne-Marie MacDonald) left me wishing for … wait, I hardly even remember finishing that one. The most galling of Oprah’s selections, however, aren’t the terrible new ones; they are magna opera of literary history. Indeed, Winfrey has seen fit to dip into the annals of literary history, pull out ringers like Anna Karenina and As I Lay Dying, and tell us why she, Oprah, thinks we should read them. Now imagine this scenario somewhat differently. Your 16 year old announces that her English class will be reading Great Expectations. Fabulous, you think. A real piece of literature, a break from the Twilight nonsense and the watering down of education. “What will you discuss?” you ask your child. “Oh, we don’t know yet,” she says. “My teacher has never read it before. In fact, she’s never read any Dickens. She just thought it would be fun to read this with a cup of tea in hand!” My guess is that you would be annoyed. And yet, Oprah does just that, only it’s worse: She has asked millions of people to follow her into some of the more difficult prose to come out of the nineteenth century—prose she knows nothing about. Put simply, a TV host whose maxim is to “live your best life” is not an adequate guide through the complicated syntax of Dickens, not because she lacks the intelligence—she is quite clearly a woman of savvy—but because her readings of the texts are so one-dimensional. Oprah’s approach to her Book Club is all about herself. Her recent announcement contained not a word of reasoning or insightfulness about Dickens’s work; instead, she explained her reason for picking two of his novels by shouting, in a lame attempt at literary humor, “Cause it’s the best of times!” Just as she deems her “favorite things” worthy of an annual consumer-fest, she happily pushes to her audience of millions whatever books she herself wants to read. Making the situation all the more appalling, Great Expectations and A Tale of Two Cities could not be more different. Focusing on wildly different themes and set in two distinct historical periods, scholars do not even regard the books as being of the same caliber—Great Expectations is often considered the far superior work.Reading them in conjunction imparts no nutritional value. This whole is not greater than the sum of its parts. Even more confusingly, Oprah’s comments about Dickens making for cozy reading in front of a winter fire misinterprets the large-scale social realism of his work. It stands to reason that her sentimentalized view of Dickens might stem from A Christmas Carol—probably his most family-friendly read and one of his most frequently recounted tales. But her quaint view of Victoriana, as she’s expressed it, belies an ignorance of Dickens’s authorial intentions. Indeed, both A Tale of Two Cities and Great Expectations are dark and disturbing, with elaborate ventures into the seedy underbelly of London and the bloody streets of Paris. How can we trust a literary guide who, ignorant of the terrain ahead, promises us it will be light and easy? Since its inception in 1996, the Book Club has carved its niche among readers by telling them that the novel is a chance to learn more about themselves. It’s not about literature or writing; it’s about looking into a mirror and deciding what type of person you are, and how you can be better. While a generally wrongheaded view of novels, this notion is all the more frustrating when the club delves into the true classics, with their vast knottiness, glorious language, breathtaking characters, and multi-faceted, mind-twisting prose. None of that matters in Oprah’s view of books, since reading is yet another exercise in self-gratification. “If you have read him, what do you think Dickens might have to share and teach those of us who live in this digital age?” the Book Club’s producer, Jill, asks on Oprah’s website. This is the Eat, Pray, Love school of reading. Indeed, Oprah’s readers have been left in the dark. They must now scramble about to decipher Dickens’s obscure dialectical styling and his long-lost euphemisms—and the sad truth is that, with no real guidance, readers cannot grow into lovers of the canon. Instead, they can only mimic their high-school selves with calls of, “It’s too hard!” Or, else, they can put aside any notions of reading to become a better reader and instead immerse themselves in the nonsense of “discovering their true selves” in novels. Despite Oprah’s joyous yelling and shepherding, despite her character guides and suggestions of cups of hot cocoa, despite the gorgeously crafted Penguin edition of two Dickens novels and the soon-to-come chats on Winfrey’s couch about how readers can find themselves in these books, the battle has been fought and the victor already decided: Oprah 1, Literature, 0. Hillary Kelly is assistant editor of THE BOOK. I see her point that perhaps A Tale of T wo Cities and Great Expectations are not the most natural wedding of Dickens’ classics. And I see her point (to a degree) that Oprah’s literary criticism can, at time, be slightly one-dimensional. strikes me as so breathtakingly condescending towards whatever it is she imagines Oprah’s readers to be, such ivory-tower-lit-crit nonsense as to be beneath contempt. Without “real guidance” readers can not grow into lovers of the canon? Meaning, I suppose, without the books being “taught,” and taught by whatever literary theory is in favor at time, those poor poor readers without degrees in English and Semiotics or whatever are incapable of understanding what Dickens was saying? Is she serious? Doesn’t she realize that Dickens, Tolstoy, Austin, all the writers (I’ll exempt Joyce from this, among others) enshrined in the “canon” wrote their books to be read not taught? That Dickens is one of the most insanely readable of all the “great” authors? What is it that goes into this kind of thinking? Back to coping with Proust withdrawal tomorrow. Welcome to The Cork-Lined Room! 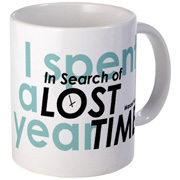 This blog is devoted to the reading, discussion and study of Proust’s masterpiece of 20th century literature, In Search of Lost Time. Supported by Publishing Perspectives, a website for international publishing news and opinion. Thanks for spending a year with The Cork-Lined Room! CLICK HERE to get a souvenir mug, t-shirt or tote bag to celebrate your accomplishment!